The Zonneschijn Dress is a hip, mod, shift dress that has major attitude! Sleeveless with a slight boatneck, the rays emanating from the center front provide the detail. Works best in heavier wovens (twill, canvas, etc) and solid colors. Try it with 2 colors up to the whole rainbow radiating from that center point! Invisible zipper closure in the back makes sure that your little one shines instead of the zipper. Sized 2-12. The Adult Version includes Teen 14 and 16. 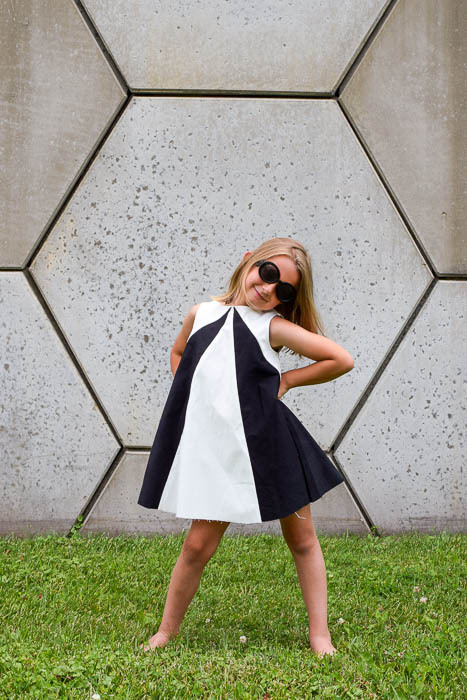 Like the rest of The Eli Monster’s patterns; The Zonneschijn Dress PDF Sewing Pattern is layered which means you only need to print the size you are making! All steps are accompanied by full-color photographs so you never have to guess where to sew or place. All of The Eli Monster sewing patterns come with full-color photographs to compliment the step by step instructions. Never second guess where you are supposed to sew or place. All pattern pieces are computer drawn; to save paper, cutting dimensions for rectangular pieces is included in lieu of drawn out pieces. 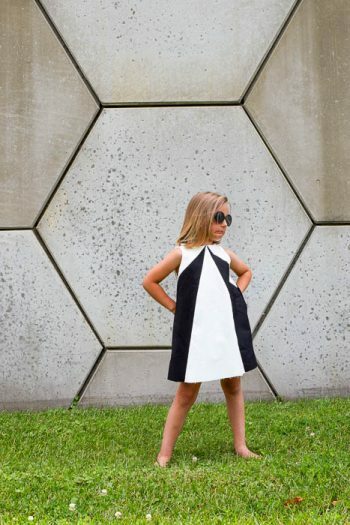 The Zonneschijn Dress is a hip, mod, shift dress sewing pattern that has major attitude! Sleeveless with a slight boatneck, the rays emanating from the center front provide the detail. 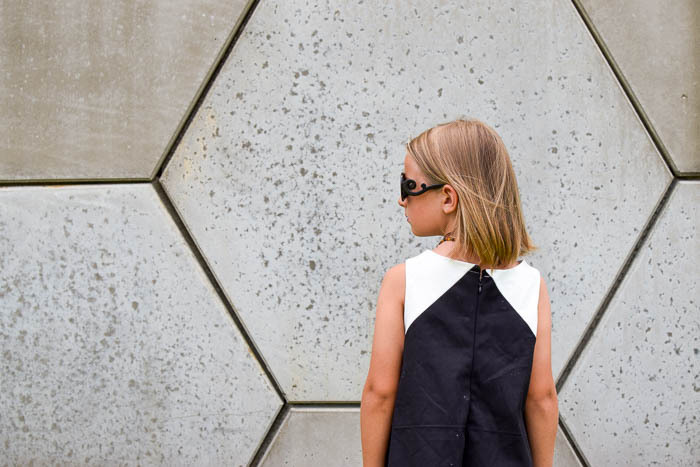 The hem hits above the knee, making The Zonneschijn Dress a perfect outfit for warmer months. Works best in heavier wovens (twill, canvas, etc) and solid colors. Try it with 2 colors up to the whole rainbow radiating from that center point! Invisible zipper closure on the back makes sure that you shine instead of the zipper. 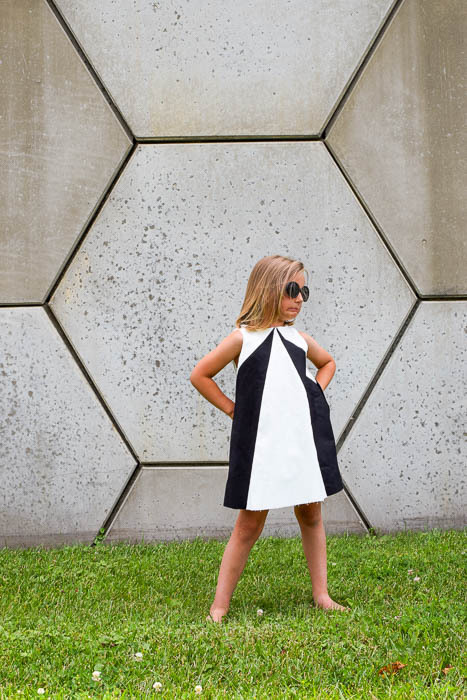 Like the rest of The Eli Monster’s patterns; The Zonneschijn Dress Shift Dress Sewing Pattern is layered which means you only need to print the size you are making! All steps are accompanied by full-color photographs so you never have to guess where to sew or place. All pattern pieces are computer drawn; to save paper, cutting dimensions for rectangular pieces is included in lieu of drawn out pieces. 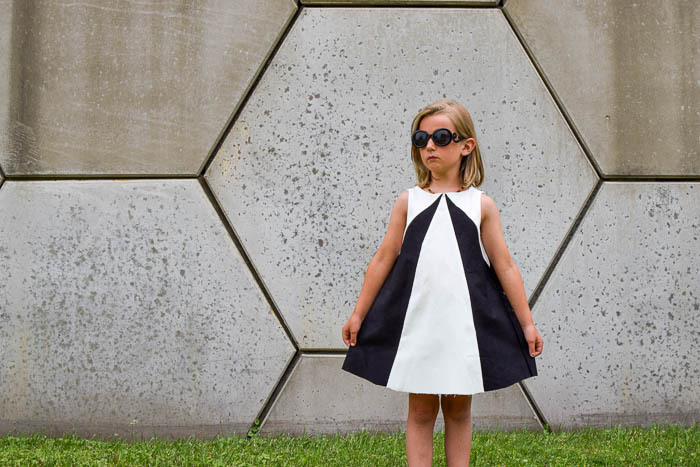 Your sewing pattern is instantly downloadable at checkout. If you signed up for an account with The Eli Monster, your pattern will automatically show up in your account in addition to being emailed to you. You will need Adobe Reader to open and read this PDF file and letter or A4 paper to print out the pattern. No paper copy will be mailed to you. You may sell items made from this pattern in small batches. Please credit pattern to The Eli Monster. This pattern is copyrighted; do not sell or copy this pattern.